Realize your potential as you drive the highly desired 2017 Ford Mustang. An aggressive and bold exterior offers two doors with spacious seating for up to five individuals lets you set off on the adventure of a lifetime. Available trim levels on the 2017 Ford Mustang include the V6 Fastback, EcoBoost Fastback, V6 Convertible, EcoBoost Premium Fastback, GT Fastback, EcoBoost Premium Convertible, GT Premium Fastback, GT Premium Convertible, Shelby GT350 and Shelby GT350 R.
Calm and collected is how you will feel as you step inside the 2017 Ford Mustang knowing the power and prestige within. Sit back in the available RECARO sport leather-trimmed seats with a low set, sporty driver's seat position. Flexibility is provided through the available 6-way power adjustable driver and front passenger seats as the small steering column and ample knee room emphasize a controlled feel. 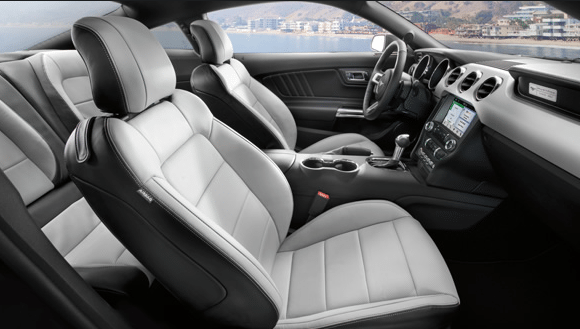 The seats come with available heating or cooling to help accommodate for differing weather climates as you enjoy the options provided by the available dual-zone electronic automatic temperature control system. This system can maintain two different front temperatures at the same time to ensure that both the driver and front passenger are comfortable. Refinement is evident throughout the interior with the leather-wrapped parking brake and leather-wrapped steering wheel. Make space for the things you need thanks to the 50/50 split-folding rear seats, which easily allow for cargo or passengers or both. Aggressive originality comes forward on the outside of the 2017 Ford Mustang with iconic and stunning details. Illuminate the road ahead with HID headlights with signature lighting, daytime running lamps, LED fog lights and LED taillamps. Express your power through the dual bright exhaust tips, hood-vent and available decklid spoiler as you embark with your head held high and your expectations higher in your new Mustang. 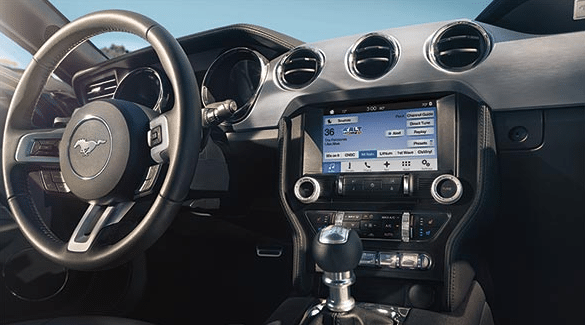 Embrace connectivity in the 2017 Ford Mustang as you experience a heightened sense of control. Thanks to the available Track Apps system you can keep track of your performance results with the 4.2-inch message centre in the instrument cluster. Communication is enhanced with the next generation of voice-activated technology as you access your compatible devices without the use of your hands. The available SYNC 3 system and its 8-inch colour LCD capacitive touchscreen also offers an optional Voice-Activated Navigation so that you can reach each destination easily. Entertainment comes forward with the Shaker Pro Audio System, featuring 12 speakers, a subwoofer and an amplifier. 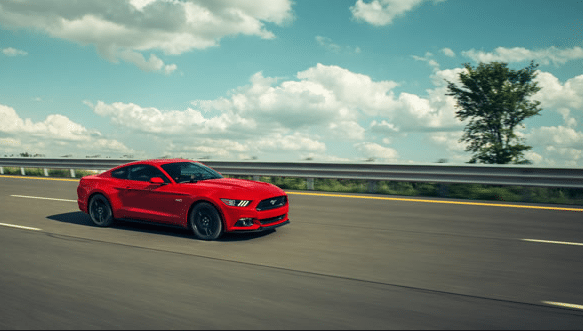 When you purchase your 2017 Ford Mustang, you are able to include Ford Original Parts and Accessories to ensure that your specific preferences are met. Customize your features as you include cargo organizers, cargo nets, cargo protectors and more. Upgrade your convenience levels through the additions of the Remote start system as you enhance protection through full vehicle covers, floor mats and door sill plates with optional illumination. Mesmerizing drivability and allure come forward with the 2017 Ford Mustang. Customize your experience and handling through the Selectable Power-Assisted Steering (EPAS), featuring three driving modes including Normal, Sport and Comfort. Responsiveness is improved with the 6-speed Manual Transmission or the 6-speed SelectShift automatic transmission, as your take on the corners with confidence and control. You can select from four powerful engines as you fine-tune your performance to meet your driving requirements. With the 5.2L V8 engine, you are given MagneRide damping so the engine can monitor and adjust itself thousands of times per second for precision like never before. Refined handling and unduplicated power are yours with every kilometre in the 2017 Ford Mustang. As a proud, long-serving model of Canada's Best-Selling Automotive Brand Seven Years In A Row, the 2017 Ford Mustang can be admired from every angle, while delivering remarkable performance. Experience the adrenaline-inducing design of the 2017 Ford Mustang for yourself at your local Vernon Ford Dealer – Watkin Motors Ford. 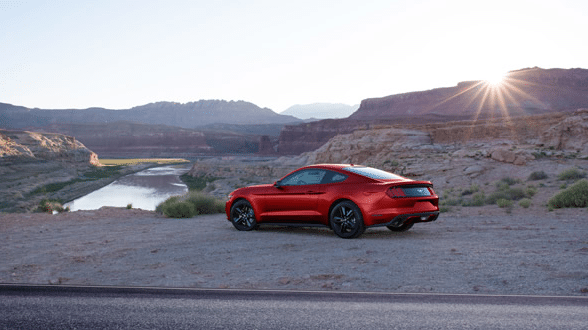 As you explore the many possibilities of the Mustang, our friendly staff of dedicated professionals at Watkin Motors Ford will be able to guide you and provide you will all of the information you need to make the best decision!